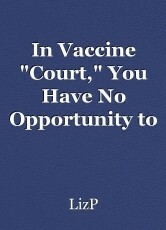 After 7 years in Vaccine "court," which is not a court at all; I learned our case was filed based upon what the attorney found easiest to file, not my child's actual case history. The attorney, no matter how inept, will be compensated (though, regardless of skill, never what they would earn for their hours on any other case); the vaccine injured clients, will be strung-along, and hung out to dry. After our telephone conversation of July 1, 2009, I was quite disappointed in your continued lack of responsiveness to my concerns. In all my years, as a professional or in the private sector, I have never been spoken to with such utter disregard. You seem to have one agenda, and it clearly does not entail communication (the equal exchange of meaningful information and collaboration which results in awareness, understanding and action). To-date, each and every conversation I have attempted with you has been entirely one-sided as you attempt to assert yourself and bully me into submission. Although it may be your practice to dictate memos to your files following conversations or meetings with your clients, it is quite clear to me that you do not take the time to actually consider your client’s concern. On February 6, 2003, we did speak on the telephone. I explained to you at that time I was concerned you had filed my daughter’s case as an NVICP claim. K does have classic “autism like symptoms,” and the origin is her shots. What you seem to have decided is that Kiera’s injury originated as a result of the administration of her MMR and Varivax shots at K’s 12 month well visit, as indicated by the documents you filed that indicate the first notice of her condition was at 15 months of age. This misrepresents the facts of K’s case. post-shot which progressed to a high fever with non-stop screaming at 17 days post-shot. By the 22nd day post-shot, K was constantly whining and screaming, had a bloody rash, and non-stop diarrhea. Number of days to onset: 0, Symptoms: Agitation, diarrhea, fever, rash, screaming syndrome, somnolence, vasodilation. It was the administration of the DTaP, HEPB, HiB, and IPV, when K was 14 weeks old, that caused K’s initial crisis and initiated her on-going condition; though I am certain on-going insult by more of the same, plus Varivax and MMR certainly did not improve her health, their administration at her 12 month well-visit was not the beginning of her decline. Because I was concerned you did not hear me in our earlier conferences, I did want to understand why you chose to file Kiera’s case under the Omnibus and was seeking information because I had concern that her case didn’t “fit” the mission of the Omnibus. You may have spoken with Ghada Anis, and she may have agreed that the Omnibus Autism proceeding was where the case should be and that there would not be two claims; I was never privy to that conversation. Further, your memo may state, “I passed this information on to Mrs. P;” I have no record of ever receiving this information. Though I do remember a conversation where you suggested I should contact Attorney Shoemaker’s office; such advice was clearly given to discourage me from pursuit of a stand-alone case as his office indicated he had no interest in new clients. If you provided me with a number for NVICP information center, I do not have record of it. On June 9, 2003, I was still quite concerned. I called your assistant, Cyndi. I was trying to understand how you were going to make her claim fit the Omnibus as it did not meet any of the four “test case” scenarios. She repeated what you had told me, but did not answer my question – WHICH test case was this going to fit beneath?Despite your insistence, in February, I did not understand how filing under the Omnibus Autism proceeding could work. I was trying to contact you to make clear my concern. Apparently you spoke with Greg Fortsch, and found that only one petition can be filed for each injury; I was never provided any information regarding this. On June 16, 2003, we finally spoke. Your memo states: “We went over the NVICP table and the various problems that Kiera had did not manifest themselves until after 3 days had expired following the vaccine. We are both in agreement that this is probably not a table case.” We were not in agreement. I clearly stated that K exhibited symptoms immediately post-vaccine. You advised me that the symptoms my daughter experienced would be excluded because they weren’t seen by a doctor; I was skeptical, but felt I had no choice other than the Omnibus, and again questioned how my daughter’s case could fit into the “test case” scenarios. I did not receive an answer from you, other than it was really my only option. It is great that K’s case has been timely filed. However, I believe it will handily lose, when her medical record is reviewed and it becomes readily apparent that K suffered neurologic sequelae from 14 weeks of age; as you filed a claim on her behalf, that her MMR at 12 months caused her disability. I have contacted your office, intermittently to ask about progress with the Omnibus, or to update K’s record – for instance, when I provided her SPECT results which indicate areas of hypofunction and hyperfunction in critical areas of K’s brain. And more recently, when I requested to add K’s most recent EEG results and MRI, which indicate temporal lobe and frontal lobe epilepsy and hippocampal sclerosis and malformation (the EEG strengthening K’s results at 2 years, and MRI indicting K’s early and on-going encephalopathy, further supported by test results indicating her body is inflamed and attacking her myelin) ; which you informed me could not be added as the file had been closed. I was NOT provided with a copy of the court proceedings, until I made said request, in June, 2009; all I have received has been the occasional Omnibus update. I picked-up a paper copy of both the medical record you filed (which I have not entirely reviewed) and the proceeding documents. Upon review of the proceeding documents, I grew alarmed. The Respondent’s Report indicates the “court” believes K’s injury is the result of the “as a result of MMR vaccination and vaccinations that contain thimerosal;” as you should be aware, this is not the case. My concern prompted my call to you. It seemed that the method by my daughter’s case “fit” was a result of misconstruing her record. It may be the case that her entire medical record was entered into record and the “court” failed to thoroughly review the record, concluding incorrectly, that K’s was a case of “as a result of MMR vaccination and vaccinations that contain thimerosal.” Or it might be a result of what was filed for review. Either way, I am concerned that the record reflect the true circumstances of K’s situation. I would expect your office would be concerned, as well. As an aside, it appears that K’s name has been is also misspelled on the court documents. For the record, her name is K P.
I listened to you and followed your advice as you are the expert and I the layperson. If following your advice leaves my daughter in “court” without a leg to stand on, I have done her a grave disservice. I sincerely hope somewhere in those memos of our discussions, held over the years, you have an answer to the concern which I have, repeatedly, expressed and for which I have no answer – unless you consider the answer to be what I read in the Respondent’s Report. Your letter failed to clear up any of my concerns. I hope my letter is more effective at communicating my concerns then I have been in our telephone conferences. The nuclear bombing of Hiroshima and Nagasaki: was the use of the atomic bomb on Japan an act of necessary evil to create peace post-world war 2 and can we rely on nuclear deterrence as a form of conflict deterrent? Give it a Rest, Already! This page was created in 0.3964 seconds.